It is well known that breakfast is the most important meal of the day. I try to eat something for breakfast each day or I find that I am starving by lunch and tend to overeat. I prefer to eat simple and easy to prepare meals for breakfast which usually consists of a small bowl of cereal, bagel or fruit. I have always enjoyed granola cereal for breakfast and love its sweet crunchy taste. I had a chance to review Nature’s Hand Granola and I have to say that they have the best granola that I have ever tasted! 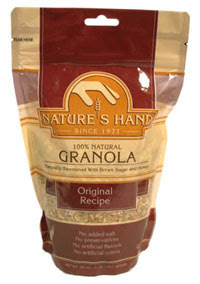 Why does Nature’s Hand Granola stand out among all the rest? There a few reasons actually. One is that it has only premium natural ingredients and is sweetened with carmelized brown sugar and honey. There is no added salt, preservatives or artificial flavours. It is also oven-baked to give it a unique texture that won’t be clumpy and holds up well in baking. They have been using this special oven-baked process since the company’s beginning in 1971. Nature’s Hand sent me a pack of each variety of granola!! I couldn’t wait to try them all out. You can use their granola as a topper or in baking. They have some recipes you can use on their website. I used mine in my cereal and absolutely LOVED the taste and crunchy texture. It had the perfect amount of sweetness and I like the fact that it is not sweetened with chemical sweeteners. It is a mixture of oats, wheat, nuts and seeds with each variety offering its own distinct flavour. My favourite flavour is Maple Pecan followed closely by Raisin Hazelnut. They were soooo good and I was sad to see the end of the bag. I think if I was to buy them again, I would buy them in bulk so they would last longer. Actually all the varieties were amazing and there wasn’t any of them that I didn’t enjoy eating. I would definitely recommend them and buy them again. You can purchase from Nature’s Hand online or find a store near you.